0 Comments Published by Terrace Crawford on 5/28/09 at 10:50 AM. Yesterday I blogged about my 90 days of focused prayer. Today was pretty special because our staff was invited by another church, Harbor Pointe Community, to join them for prayer. I really had no clue of the specifics of the meet-up until I arrived on site. 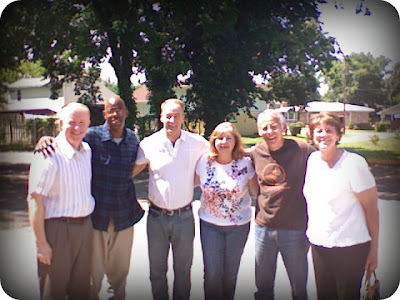 The lead pastor & staff of Harbor Pointe called their church to 10 days of focused prayer and as the pastor put it today "we wanted to have focused prayer for churches in our area during this 10 days." Each day they invite the staff from a different church to come and pray. Wow. Talk about a kingdom mindset. This is what I am ALL about. Tom Andrews (lead pastor) and the staff & Harbor Pointe encouraged our staff so much today. There was scripture reading, communion, prayer for each staff member and before it was over we were singing. Oh, and one pastor, whose church was scheduled for tomorrow's prayer meeting, came today. When the the lead pastor asked him if his intention was to come today in lieu of tomorrow's meet-up he replied, "No, actually I wanted to pray for another church. I'll be back tomorrow." 2 Comments Published by Terrace Crawford on 5/27/09 at 5:14 PM. Editor's Note: This not a post about prosperity prayers but rather a personal (and candid) snapshot of my faith on the rise and true accounts from the last 90 days of my life as well as an anticipation of whats to come. A good friend challenged me a while back to spend 90 days in focused prayer. I must be honest, I find prayer difficult at times so I wasn't exactly "thrilled" when he encouraged me to do this. Prayer is hard work ... and sometimes its even boring. Yea, I said it. With that said I must also say that I believe its key to communion with God and I've seen prayer work in my life - over and over again. I know MYSELF so well that I knew I would have to do little things to help me focus during the 90 days. 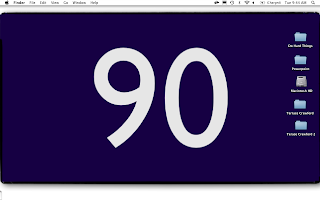 One of the things I did was just changing my wallpaper to a simple nine-zero. You may recall this from a previous post. Ironically, it didn't help me much. Boy, the enemy is slick right? 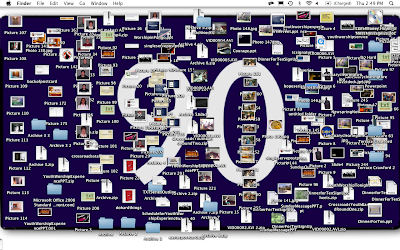 My eyes would blow right past it each and every time I would start up my computer, never seeing the nine-zero. Of course, this could explain it also. Perhaps its not the enemy's fault? I'm not a person who neglects to ask God for things for myself, but sometimes I don't ask him as much as I probably should. Bottom line: I just don't pray enough. I truly believe God is the giver of all good things and wants to give us (his children) lots of things, sometimes we just need to simply ASK. I have a good friend who has always been an inspiration to me. I believe he prays about EVERYTHING. One day he told me that he had been needing a pair of shoes for a few weeks. He went to the stores and perused through the stock, priced them and just ... prayed about it. He knew which pair he wanted but never bought them. One day within a matter of two weeks a knock came to his door and there were the shoes! The exact shoes he wanted. WOW. My faith has so increased just listening to him. I never believed I could experience the same things he did. Perhaps my faith was just too small? I'm anticipating another miracle. I want to take students to Charleston, South Carolina this summer to minister in urban communities and we need money. In fact, we really need to raise $3,000 in 3 weeks in order for this mission to even happen. Thats not all. Truth is, our entire church is anticipating a miracle. We've been meeting in an elementary school for years and our members feel God is calling us to build. Now. We are about to launch a fundraising campaign and need around one million dollars for this project. Gulp. I'm not sure what you are taking away from this post. I just felt compelled to write it. Hopefully its offered a bit of encouragement for you... or perhaps made your faith rise. I sure hope so. Otherwise, maybe its to help us pray or support us in the area of our financial need. For now, here's to our faith... on the rise! If you'd like to make a tax-deductible contribution towards our mission this summer, please contact me for further instructions. 1 Comments Published by Terrace Crawford on at 12:54 PM. 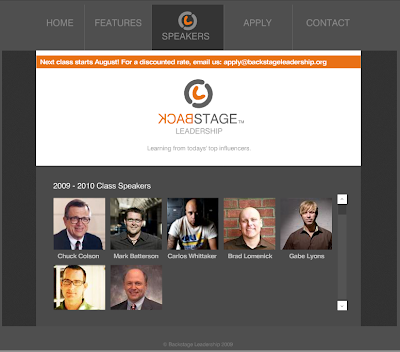 One of the founders of Backstage Leadership contacted me the other day to tell me about their programming. I wasn't aware of this leadership opportunity but I've learned a lot in a short matter of time. As part of this 10-month coaching program you will get to interact with some of today's top leaders including: Mark Batterson, Chuck Colson, Brad Lomenick and Carlos Whittaker, among others. In addition to some private coaching, the leadership program loads you up with resources, you get a private lunch with selected speakers and lots of opportunity to connect with these key leaders and ask them any questions your little heart desires. The next round starts in August, so you better sign up soon. 0 Comments Published by Terrace Crawford on at 10:41 AM. 3 Comments Published by Terrace Crawford on 5/26/09 at 7:00 AM. "I said to them, 'Whoever has any gold, let them tear it off.' So they gave it to me, and I threw it into the fire, and out came this calf." I immediately thought of the Cash 4 Gold commercials with MC Hammer... and laughed. 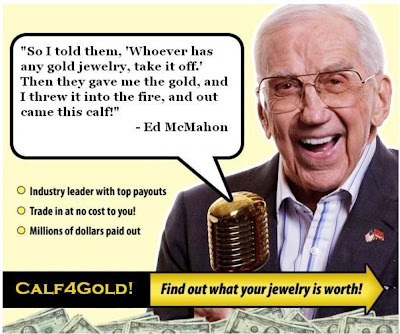 In this case, Calf 4 Gold? 2 Comments Published by Terrace Crawford on 5/25/09 at 8:42 PM. This is the Manic Monday Minute - Memorial Day edition. First off, thanks to everyone who serves or has served in our military. I applaud you and your family for your sacrifice. Had a great time this weekend hanging with my family. They came to visit me from the great state of South Carolina. They spent the last four days with me. The 4 days came and went too soon. Went fishing on Friday on the James River. I caught 3 fish. Great services this weekend at Crossroads. It was very cool having my family in the services. They loved our services. My sister thought our worship pastor's voice sounds like Mac Powell from Third Day. Hung out with some friends today. We grilled & chilled. And played about 15 games of volleyball. It was one of these "bring your own meat" parties. I brought what I called a man-burger. It was HUGE. Ended up throwing it away because it didn't cook very well. Ha. Fortunately, one of my good friends had an extra steak on-hand. Welcome to my newest tweet peeps! I've got to get back on a reading schedule. I have SO many new books I want to read. Just updated my itinerary with some new dates. Had a great time speaking in Richmond, VA last week. Made some great connections and met a lot of cool youth workers. Love connecting with youth workers from all over the country. MTV contacted me. They want to do an episode on purity for their show "True Life." They are specifically looking for people who are saving their first kiss for marriage. If thats you, contact me. They promised me this would be a tasteful show and not reflect negatively on those choosing purity. My friend Zak White just made a huge announcement. I'm excited about his new journey. Just added some more RAM to my mac. I'm stoked. Enjoyed the listening party last night. Hillsong's new album rocks! I'm going to be lost without American Idol this week. One of the founders of this ministry contacted me today. I have never heard of this leadership training but it looks great. Lots of familiar, top-notch speakers & presenters! Check it out if you are jonesing for some leadership training. More to come on this. Had a great time hanging with @churchydave and @kasdaniels tonight. We had some wings. Oooh yea. 0 Comments Published by Terrace Crawford on at 9:30 AM. Last night I stopped by Carlos Whittaker's listening party for a while. 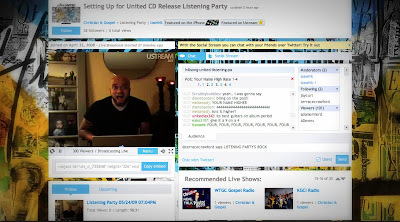 He decided to host a special HillSong United Listening Party so his peeps could preview the new album by Hillsong, scheduled to drop this Tuesday. Good times. GREAT album. I simply MUST see them when they come to Virginia Beach in June. 1 Comments Published by Terrace Crawford on 5/21/09 at 10:01 AM. It is my opinion that one of the areas where the church (at large) is really weak is in equipping people how to share & defend their faith. Furthermore, I have the opinion that it is critical our youth ministries make a shift in its programming to help students in this area. This is such a firm belief for me that a few years ago out of my great conviction I immediately called our leadership team together and shared that we would immediately begin to focus on several different areas in our programming. I soon put pen to paper and wrote down several things that needed intentional focus in our student ministry. I determined that I wanted students to know four things by the time they graduate from our youth ministry: (1) know what they believe, (2) know why they believe it, (3) know how to share their faith, and (4) know how to defend their faith. I must admit, it was what I thought (and still do to some extent) a very lofty goal. We have six years with students (middle & high schoolers) in our youth ministry and that is a lot of time (and yet it passes like a vapor! ); however, we've had to be very strategic in making the most of our time with them as we program, disciple and mentor. Quite honestly, I'm still not happy with my plan & approach but its something that is still a very strong conviction for me and what I feel is very important for all of us, as leaders, to consider. Today I spent most of my day at a network meeting in Richmond, VA listening to apologist Mike Licona. Mike is author of Peter Meets Muhammed and The Case for the Resurrection and is the apologetics coordinator for the North American Mission Board. In his role he spends a great deal of time speaking at colleges & universities debating people of other religions. NAMB has spent hundreds of thousands of dollars developing resources, specifically a website that you must check out, to help equip leaders in the area of apologetics. This is only scratching the surface (and a small tease for what is to come here on the blog) but I hope to continue the conversation and even brainstorm with you leaders about who is really providing some great resources in this area and who is leading the way and could offer some insight in teaching & equipping our students in these different areas. 4 Comments Published by Terrace Crawford on 5/19/09 at 7:25 PM. One of my students showed me this video last week. I was dying! Milton: "I took my grandma car because I got mad at my mom. And then I suddenly had my friend come in. And he smokes with cigarettes." Milton: "I wanna do it 'cause it's fun. It's fun to do bad things — and drive into a car." Reporter:"Did you know that you could perhaps kill somebody?" Milton:"Yes, but I wanted to do hoodrat stuff with my friend." Reporter: "You don't think you should be punished for all of this?" Milton: "Just a little bit — no video games for a whole weekend." 2 Comments Published by Terrace Crawford on at 6:55 PM. I just finished watching the last round of American Idol, season 8. Last week GOKEY went home. Gokey was my pick to win from the beginning, so needless to say I was a little disappointed when he didn't make it through. I must say that these two finalists, Kris Allen and Adam Lambert have done extremely well this season. Adam is clearly a well-seasoned performer and Kris has been improving a little more each and every time he has performed and the grassroots effort (by his fans) to help him earn the title of American Idol is unprecedented. I actually spent about 30 minutes on a Kris Allen fan site last week after the show went off-air and was nervous because I could hear the fan train literally pushing Allen ahead of Gokey. Then I noticed that only Lambert and Allen were mentioned on Twitter trends and I knew that Danny would be packing his bags. I honestly don't know who will take this. I think its anybody's game. Adam has got an incredible vocal range but every song is starting to sound the same to me. Kris, on the other hand, has pulled a few performances (like last week's rendition of Kanye West's song Heartless) that has blown me away but his fate is totally in the hands of Danny Gokey's fans. I have been ready to predict Adam Lambert as the winner here after Gokey left the show but I can see Danny Gokey's fans voting for Kris Allen over Adam Lambert. Ok... I'm signing off so I can cast my vote. 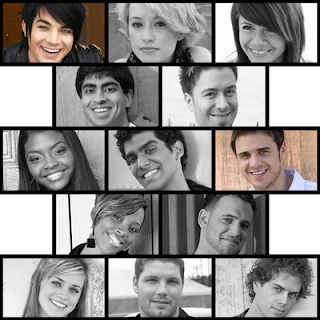 Who will be the next American Idol? We'll find out tomorrow night. Drop me some comments and let me know your thoughts. 1 Comments Published by Terrace Crawford on 5/18/09 at 7:43 PM. Had a great time this weekend hanging with some old friends. Threw a party at my house. Lots of fun. I think there was around 50 people at one point. Great services this weekend at Crossroads. Quite possibly my favorite service yet! I just loved the song set, the message, everything. Chuck did a great job continuing our Grow Up! series. He spoke on Childish Faith vs. Childlike Faith and used a great vid clip of Ken Robinson speaking at TED. Love that talk too. He also used children's pictures of what God looks like (at least in their mind or imagination). I loved it! It was interesting to see how their view of God changed as they got older. Had a great youth worship experience last night, in spite of a couple of surprises. We had a spider try to attack us during the worship set. It was wild. Students were flippin out. I'm currently in Richmond, VA speaking at a conference. Met this guy and hung out with him for a while today. He is up to some great stuff and making an incredible impact in the kingdom. Had a great dinner earlier at TGI Fridays. Enjoyed chatting with this cool lady on the phone today. She rocks! I'm adding her to the blogroll. Hung out at the mall tonight. Stopped by c28 - a pretty sweet store. Love what they are doing. Every person that shops there gets prayed for. They've seen over 12,000 accept Christ in one year through their stores. Ugggh! Still have the cough. Wha? My mother's twin sister is now on Facebook! I met two people today who had accents I wasn't expecting. It was weird. Anyone ticked gas prices have been creeping back up? I paid $2.21 per gallon tonight. Sheesh. Tried some Bod cologne spray today. It smells good! Ok - I didn't talk American Idol last week. Yes, I was disappointed Danny Gokey got sent home. More thoughts on American Idol, including my prediction, tomorrow on this blog. Had a nice Iced Mocha from Starbucks via Barnes. Screen Test for Nacho Libre 2? 1 Comments Published by Terrace Crawford on at 2:01 PM. Just in case... 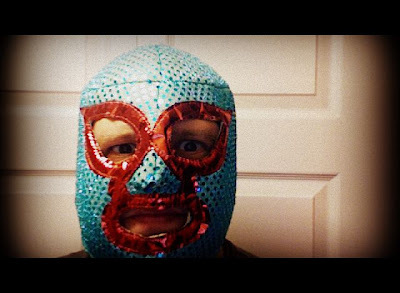 I've got my lucha libre mask (courtesy of @churchydave and @kasdaniels recent trip to mexico). Now I just need some stretchy pants. 6 Comments Published by Terrace Crawford on 5/14/09 at 7:46 PM. A special vid for Chick-Fil-A addicts. 0 Comments Published by Terrace Crawford on 5/13/09 at 12:21 PM. I have worked with scores of mainstream artists over the years and have also worked with local talent too. 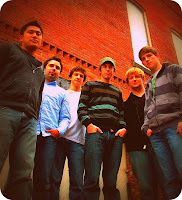 A local band that I have been so impressed with is known as "Stand Still." This high-energy worship band based in Virginia Beach is made up of a group of guys who love to jump around, go crazy and shout at the top of their lungs. At least, that is what their Facebook profile says. I can tell you firsthand that these guys (Jon, Andrew, Nic, Logan & Cameron) are the real deal and are passionate about uniting this generation in worship! 0 Comments Published by Terrace Crawford on 5/12/09 at 6:30 PM. I laughed through this entire parody Q&A with John Maxwell. Tripp Crosby is hilarious. For more on Tripp's work check out his YouTube channel. 0 Comments Published by Terrace Crawford on 5/11/09 at 8:59 PM. Great services this weekend at Crossroads. We served muffins to the entire congregation and gave out flowers to all mothers on Sunday. I love all the cool stuff we're doing. We showed this sweet new vid from Igniter. Love those guys. I was the announcement guy on Sunday in our weekend services. When I'm not preaching I'm the announcement guy or the prayer guy - in addition to being the producer guy. Sunday I went nuts. Well, it looked as if I did anyway. My cue cards hit the floor and from there it was a bit of a train wreck but apparently it was hilarious! 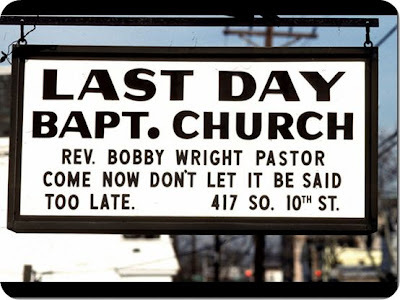 The congregation was dying. I was nervous as to how it was perceived but knowing that I made some people laugh is good enough for me. I certainly try to bring laughter to the world - we need it. Its o-so-good for us. My alma mater is now promoting my blog on their website. Thanks guys! If you are an alum and fellow blogger let me know and I'll pass your URL onto them. Maybe they will promote yours too. While I'm at it, congrats to WMHK-FM - the radio station I use to work for - who just won a Dove Award for large market station of the year! Sinbad presented the award to them. Weather was awesome yesterday. Not too bad today either. Spent the afternoon over at my pastor's home. I need a new washer & dryer so I asked if I could do laundry over at his house. :=) He then spent time training me on Media Shout Version 4. We are so productive it ain't even funny. A friend called me and said he drove an hour to see me and was at my house thinking I was throwing a party this evening. I wasn't home. We went out for dinner and had a grand ole' time catching up. He gave me a free copy of a book by Greg Stier entitled "Venti Jesus Please." I plan to start reading it tomorrow. Did you see the post about Ben Arment's new venture, Story? The dude just oozes creativity. I updated my myspace page. First time in about 6 months. I need some new friends there - so add me if you like. Ugggh! I cannot get rid of this cough! Its really annoying. 3 of my very good friends have just accepted a new calling - church planting. Congrats to all 3. I count it an honor to know you Mike, Clayton and Jason. Another has spoken with me about his future -- and it looks like its church planting -- but not sure if he's made it public yet. Scary. A youth pastor, turned church planter, said to me over a year ago that if I hang out with church planters too long I'll become one. That is his story. One of my students tried to slam me last night after our youth worship service and my button on my shorts popped off. It was pretty hilarious and slightly embarassing. Anyone sew here? Ha. Had a great time hanging with a friend at Dunkin Donuts last night. We scored some free food there. Haven't eaten at Dunkin in a long time. Who knew they served pizza now? I thought I was in the twilight zone. Showed this video prior to our youth service last night. That junk is funny! Got to see Star Trek on Friday. It was really good. 1 Comments Published by Terrace Crawford on at 2:20 PM. 0 Comments Published by Terrace Crawford on at 9:40 AM. Introducing STORY. 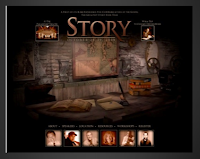 My friend, Ben Arment, has whipped up a first-of-its-kind experience for communicators of the Gospel - the greatest story ever told. It will be held on Wednesday, October 28 at the Paramount Theater in Aurora, Illinois. Speakers include Donald Miller, Nancy Beach, Dave Gibbons, Ed Young, Stacy Spencer, Chris Seay and Mike Foster. A day of workshops will follow on October 29 at nearby Orchard Valley Community Church, featuring illustrators, designers, scholars, authors and communications experts. Register for the conference and enter to win 2 free trips to the Kilns - CS Lewis’ home in Oxford, England! Find out more at www.storychicago.com. 3 Comments Published by Terrace Crawford on 5/8/09 at 6:25 AM. Crap! Did I miss the last day of church? 6 Comments Published by Terrace Crawford on 5/7/09 at 11:49 AM. This is my current desktop. 3 people looked at my desktop today and shook their heads in disgust. I definitely need Less Clutter & Less Noise. 0 Comments Published by Terrace Crawford on 5/5/09 at 8:16 PM. Well, not really. Its actually dinner on KFC and Oprah. 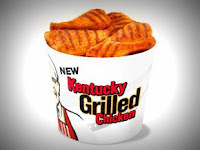 Oprah thought it would be cool to give the American people the hookup and treat them to dinner so she got KFC to donate a 2-piece meal of their new grilled chicken (which is not bad - I've tried it), sides and biscuit for each person in your family (limited to four persons). I spotted this on twitter and decided to let you know about it. You only have 24 hours to download the coupon (which is good for two weeks) and, again, you are limited to four downloads. Enjoy! and spread the word. 0 Comments Published by Terrace Crawford on at 10:27 AM. 0 Comments Published by Terrace Crawford on 5/4/09 at 8:23 PM. This is the Manic Monday Minute - swine flu & gluten free. Ok - thats my last swine flu joke. promise. My pastor and I have been talking about the swine flu hype. He quoted some statistic to me the other day that over 1,500 people (or something close to that) die every week? from the flu (maybe its per day, idk...) but just because this one has a name the media is all over it. So no mo naming of the flu, deal? We can describe it... but DO NOT NAME THE THING. I've gotten some new traffic lately on my site. Not quite sure yet where you came from (my analytics is acting up) but I just rolled out the welcome mat for you anyway! Drop me a note or something and tell me your story. Glad ur here. Participated in a little #twiblestudy earlier today. Its all about twitter. I don't understand people who aren't addicted to social media like me. I'm living inside a freakin bubble. I got one of those calls tonight from a timeshare resort. Apparently I won a 3-day vacation with a $125 Visa card...yadda yadda yadda. They wanted me to plan my vacation (and who would spend it with me since I'm not married or cohabitating with anyone) tonight (within a 3 hour period). Typically I might be able to plan such a thing given 2.5 or more hours... but its a manic monday! miracle-man was at church Sunday. This was cause for a wonderful celebration. I've been amazed at how God has used this! I'm getting harassed for releasing the pet turtle in the botancial gardens. Apparently that was *not* the thing to do. Trying to decide which NYWC location to attend this year. Are you going? Woah, my cell phone is blowing up. Rob Bell announced his new speaking tour this week. Hmm... looks like Charlotte is the closest. Rob, we need to talk. I actually spoke with a close friend of his earlier today. She is so cool. Ugh. Professional Wrestling is so predictable. I'm trying to get myself onto a bit of a health kick. Its harder than I thought. Wrapped up our Courage series on Sunday. Start a new series, "Grow Up! ", this Sunday. Should be good. We're serving muffins to our mothers (among some other cool surprises) this week for Mother's Day. On Sunday I announced from the stage that I planned to recruit one mother to get me some muffins. Funny video coming tomorrow in honor of You Tubesday. 3 Comments Published by Terrace Crawford on 5/2/09 at 3:22 PM. Crossroads had an exhibit at a local children's festival earlier today, attended by over 10,000 people. We met around 1,000 of those - and did crafts with hundreds of children. This is one highlight. Me: (looking at a mother) "Would your son like to write his name on this card?" Woman: (to me & our volunteers) That's his signature. Me: (with excitement) Looks like he's gonna be a DOCTOR! Reaching one life at a time... and occasionally inserting foot into mouth.